BYU Sports According to Tasha: September 26, 2015 is going to be the best day of my life!!! September 26, 2015 is going to be the best day of my life!!! 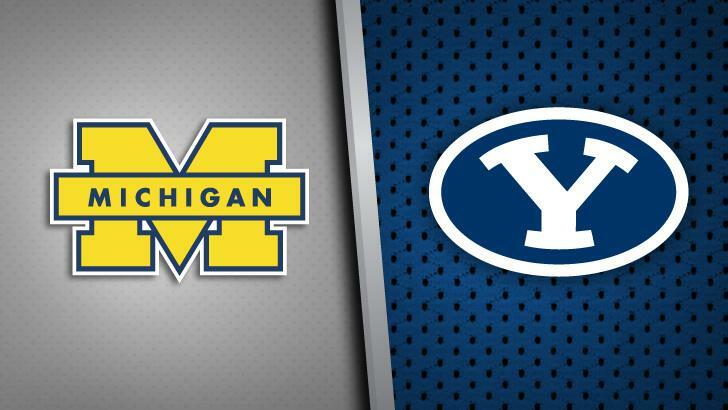 My two favorite football teams are going to face off for the first time in my lifetime on September 26, 2015: BYU IS PLAYING MICHIGAN IN THE BIG HOUSE!!! I am so unbelievably excited! The #1 thing to do on my life's bucket list is to attend a BYU / Michigan game in the Big House . . . and now that dream can finally become a reality! I've been joking with John, a co-worker of mine, for the last few weeks that he needed to talk to Tom Holmoe and get a game for BYU in the Big House in the near future, and somehow it actually happened! (Not sure I believe John, but he was trying to take full credit this afternoon as I pranced around the office in jubilation . . . haha). 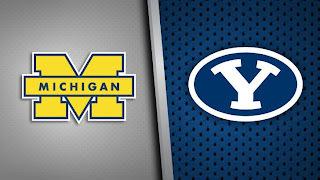 Now, as I try to calm down, I guess maybe I should give a little background as to why I'm a Michigan fan (second only to my loyalty to BYU) because it is a little strange, especially since I've never even been to the state of Michigan. My dad got his Bachelor's and Master's degrees from BYU, and then he and my mom moved to Ann Arbor so he could get his PhD from the University of Michigan. My two oldest siblings were born there. I'm not quite sure how it happened, but my dad became the biggest Michigan fan on the planet during those years they spent there. Even though he ended up having much longer histories with both the University of Utah and BYU (attending the Y and teaching for both the Y and the U for many years), he remained 100% faithful to Michigan, even after the family moved back to Utah. Anytime someone would ask him who he liked better between Utah and BYU, he'd answer without hesitating: "Michigan." My Dad and I cheering for the Wolverines when I was less than a year old. Go Blue! On Michigan game days, the flag with a big goldenrod M (yes, it was always "goldenrod"-- never just "gold" or, heaven forbid, "yellow") flew proudly outside our home, my dad would break out his Michigan sweatshirt and socks, and he would be glued to the couch for 4 hours, where nothing could distract him (sometimes we'd try yelling "FIRE!" just to see if that would faze him . . . it never did). If Michigan beat the Buckeyes, he would wear his Michigan tie to church the next day and smirk proudly at a few Ohio State fans in the ward. It was all in good fun. My dad passed away from brain cancer nearly 3 years ago. When he lost his hair from radiation and chemo, I crocheted him a Michigan hat that he wore all the time. And one of the last memories I have of him is when one of his good friends and a fellow Michigan fan visited him in the hospital and brought him a Michigan rally towel as a gift. Even though Dad couldn't even open his eyes to see it, when we told him what it was, he clutched it in his fist, and wouldn't let go. Since he passed away, for some unknown reason, I have felt the need to carry on Dad's legacy of Michigan fandom. When people ask why, I usually say that if I don't cheer for Michigan, he will probably haunt me. :) But the truth is, I really do like Michigan. They have a great team, and unlike many other teams, they play good, fair, fun football. On September 26, 2015, I will be cheering for BYU, but no matter who wins, I will be enjoying every minute of it. As a re-match of the 1984 national championship game and with Taysom Hill as a senior quarterback, it's going to be AMAZING. My Dad will be there next to me . . . and I won't even have to buy him a seat. I hope he's as excited as I am. :) The next 3 years can't go fast enough! Go Cougars and Go Blue!!! That is a very cool post. It was a little bit of a tear jerker. That John guy that you talk about sounds really cool an handsome too!